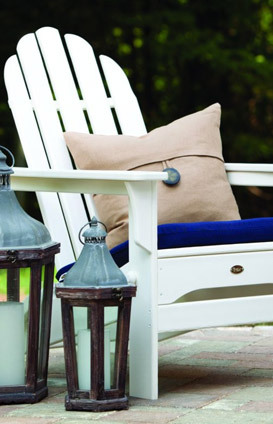 Adirondack chairs are a part of outdoor living. Their classic design dates back to the early 1900s and is named for the part of New York State where it was first made. The Adirondack design has a low, angled seat and back which allows for a very comfortable and stable chair that is ideal for hilly regions. The Cape Cod Trex Adirondack Chairs from Adirondack Authority are very roomy with a stylish curved back. It is made of the Trex Outdoor Furniture’s HDPE solid lumber and will not split, rot, crack, warp or fade. One winner will win a Trex Cape Cod Folding chair. I’m not sure if my subscription to Adirondack worked or not. I tried, though! Love the chair! It would look great in our backyard. Pin this image button is not working so go to http://www.adirondackauthority.com/trex-outdoor-furniture.html to create your own pin. I haven’t been able to enter your contests lately for 2 reasons. The first is that the right hand column obstructs the rafflecopter. The other is that my facebook page has maxed out. I have tried a couple ways to fix facebook; both are tedious. I normally do not use rafflecopter for this reason. This was a sponsored giveaway from a client so I had no choice. Maybe start another FB page just for contests?